Feline nutrition is very important for general health. However, the plethora of dietary options, brands and formulas available to consumers can be confusing, when deciding which kind of cat food is best for your feline friend’s health and wellness. At Eastside Animal Medical Center, we take pride in providing our patients and their human caretakers with all the information necessary to help cat owners make educated decisions about all facets of feline nutrition, cat foods included. We partner with Royal Canin and the global veterinary community with a strong commitment to deliver the right nutritional solutions to cats and dogs. This partnership helps drive the focus of Royal Canin's science-based innovation with the goal to develop diets that meet the nutritional needs of our patients. Check out Royal Canin's prescription food here. 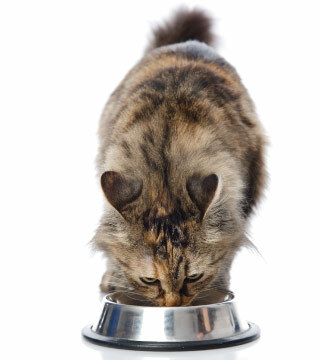 There are may great options for both dry cat foods and wet cat food for adult cats. For many of our feline patients, it will be a good diea to introduce canned food as part of their diet during this time to increase their water intake. Some premium food brands have developed formulas of speciality, prescription formula dry cat foods which can be sound choices for cats with allergies, certain health conditions, and as part of a diet also containing canned or fresh food.